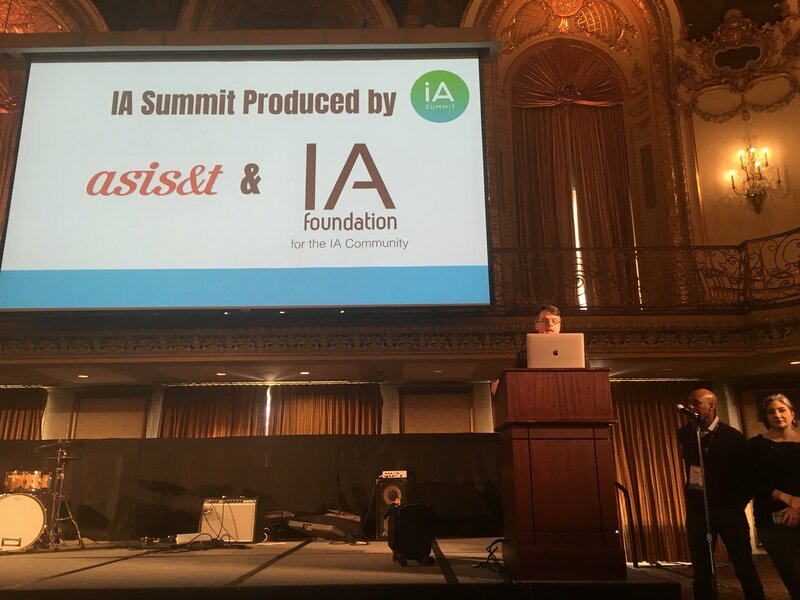 This was my first and last IA Summit, but that’s purely due to exciting news. The IA Summit will henceforth be the IA Conference. Along with that change comes a change in responsibility as ASIS&T will no longer be underpinning the conference. Instead, the IA Conference will be truly by and for those in the field, and entirely volunteer-run. Conference co-chair Stuart Maxwell opened this year with a truism, “The field is deep and wide, and the problems are fascinating and wicked.” And from that deep and wide field with fascinating and wicked problems, key themes emerged during the conference. Don’t complicate what was once simple, but do make simple what shouldn’t be complicated. The first was said by Bill Horan in Digital + Physical: Designing Integrated Product Experiences and echoed in other sessions. After all, a broken escalator is still stairs, as paraphrased from the old Mitch Hedberg comedy bit. Don’t complicate what was once simple. Alberta Soranzo shared in Our Eternal (Digital) Afterlife that in England you only have to tell the government once that someone died rather than contacting each separate department. A prime example of what shouldn’t be complicated. Make sure the quality of the question is solid before trying to find the right solution. Both Dan Ramsden in Converging with Curiosity: Defining a Discipline and Erik Dahl in Designing Our Futures emphasized both sides of the design thinking equation: questions and answers; problems and solutions. The core problem, though, is that problems don’t often stand still long enough to solve them. A prevalent theme among IA Summit contributors ethics was discussed, from many different angles. “You’re in the room. You’re hearing this. This is now your job,” is how Diana Deibel and Ilana Shalowitz put it. • We need to understand shortcuts people make and make the right answer for them the easiest one — the one that’s better for the person, not better for the company. • Structuring information — the base of what we do as IAs and UXers — is meaning-making and should be ethically considered. “The most likely point of failure is the end users, those affected by this change, so start there. Evaluate the harm,” as shared in the Ethics Roundtable. Community, stakeholders and stockholders — in that order. Have a system in place BEFORE something happens. Systems of response: have a system in place BEFORE something happens. Have a game plan and policy. Who’s carrying the burden of people’s safety? Why are we including or excluding these users? How are we protecting our user’s security and privacy? What information are we sharing with the user and why? Deibel and Shalowitz encouraged the use of responsibility statements, to be shared with others both in your company and the broader community. These should not just list the benefits but discuss the trade-offs you made to include the features you chose. Don’t be afraid to defend your decision, but also don’t be afraid to question it. Not every disability is visible. 15% of people have trouble with telling left from right. Telling them to look for something at the top left corner of the screen is not helpful. Medical and temporary conditions, cognitive impairments, pain, and medicine side effects: these count too. Designing for accessibility isn’t just about formal disabilities. Medical or temp conditions, cognitive impairments, pain, med side effects etc all impact ability to access. Everyone experiences disability at one time or another. If you’re struggling to open doors with groceries in your arms? That’s a momentary disability. Designing for disability and inclusion uncovers hidden needs. People with disabilities have unique skills. When we design for extremes we come up with better solutions than when we design for the norm. Combine viewpoints in a cooperative, not a competitive way, for best results. To collaborate, create a diverse team with a shared understanding of goals and collectively generating solutions. Establish psychological safety; include cultures, perspectives, practices, and products. Karen VanHouten recommends creating a code of conduct collectively and enforcing it. Farai Madzima talked about cultural bias in design and highlighted that aspects of combining cultures include perspectives, practices, products. Perspectives: meanings, attitudes, values, ideas. Practices: patterns of social interactions. Culture includes modes by which you persuade, decide, disagree, evaluate, trust, schedule, communicate, and lead. Know what you and your culture bring. Where you come from is an important thing for you to recognize, says Miles Davis. Bring that here where we are and you’ll create something that’s transcendent. And non-diverse groups may not make good choices. What Metrics Should You Track?